This course is for the novice user who has little or no experience with Microsoft Word except for our Word 2007 Basic 1 and Basic 2 courses. We will begin by learning about Page Setup. 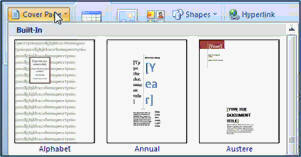 You will see how to adjust your margins, change the page orientation, paper size, and setup columns. Next, you'll learn how to use page breaks to force the end of a page, and column breaks to force the end of a column. You will learn how to add line numbering to your documents, as well as hyphenation. You'll also see how to give your columns that nice, clean newspaper look. Next, we'll add a watermark to our document, change the page color, and add a page border. In the next lesson, we'll learn how to fine tune our paragraph indenting, see how to indent the right side of a paragraph (so we can create direct quotes), and change the spacing before and after a paragraph. Next we'll learn about the Cover Page Gallery, how to insert an automatic blank page in our document, and another way to insert a page break. In the next lesson, you'll learn how to add hyperlinks to your documents. You'll see how automatic hyperlinks work, and how to create manual hyperlinks to Web pages, email addresses, and even other documents on your computer. Next, you'll learn about adding headers and footers to your pages, as well as adding page numbering. Finally, you'll learn about one of my favorite features: Tables. You can use this to display data in a nice, neat fashion. We'll make a sample price listing. You'll see how to insert a table, use the Table Styles Gallery, change the table color, insert and delete rows and columns, and change the cell alignment. Again, this is the perfect class for anyone who is new to Microsoft Word 2007, and has finished my Word 2007 Basic 1 and Basic 2 courses. 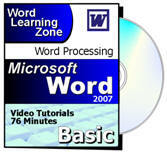 If you have little or no experience with word processing, or you just want to get familiar with how Word 2007 works, this class is for you. Richard Rost on 9/4/2009: One important thing that I forgot to mention in the video is that if you create a hyperlink to a document on YOUR computer, such as C:\MyFile.txt, and you send that document to someone else, the hyperlink will probably NOT work on their computer, since they don't have that C:\MyFile.txt file. Likewise, if you're on a network, and you link to H:\MyFile.txt, then the link won't work unless the person you're sending the document to ALSO has the same drive mapped as H:\ (such as a public share). When in doubt, you can use UNC paths (universal naming convention) such as \\SERVER\Shared\File.TXT. avi barhom on 6/2/2011: I understood that inserting a page number will eliminate the current Header. What is the best way to make them co exist ? Edit Header seems an option but maybe not the best one ? I can see a similar issue with replacing the Header style while the Page Number is there. Sorry I just need to clarify that. Is there a method for creating columns on a page and have the columns work independently from one another? What exactly do you mean by "work independently from one another?" Chris Daniggelis on 8/4/2011: Work Independently? as if the other did mot exist. Like I was printing two unrelated advertisements, as an example. Delilah Orloff on 1/31/2012: Love your insturctions so far,but in this lesson, video is stuck on the Cover scene and not showing your instructions, audio however is on. I've created a document with a blue "Page Color". But when I view the page in "Print Preview"(and print the page later), the background color turned out to be plain white, and not blue. Why is this so? Why is it that the printed page background is not blue as I intended? What has gone wrong? Also, when I convert the page to PDF format, the page background is also plain white. Why is this so? Normally the page background color does NOT print. This is the default setting in Word. I guess Microsoft thinks that if you set a background color you just want to see that on the screen and not blow through tons of toner. Under the Print Options section, check "print background colors and images." You should have checked Google first, and I should have read through ALL of the questions posted before answering them. :) Ha ha. Copy the text, paste it into NOTEPAD (Windows Accessories) and then copy and paste it back into Word. That will drop all formatting and keep the text. Jerry Fordyce on 1/11/2014: How do I avoid tiny pages towards the middle of the blank window area? I can just get a few legible words on a page! Please, help. Jackie on 12/1/2014: I can't seem to get this video to play? It's just a dark screen? I've just tried and it's playing for me. Can you try logging out and logging back in again. There is further troubleshooting advice here. Padma Velaga on 1/29/2015: I am so exited to know about hyperlink that can take you to other documents and files. I have been waiting for this lesson. Your classes are very informative. Gwendolyn Branch on 4/12/2015: I am trying to purchas Word Basic 3.The system doesnt show that level available for purchase. Please tell me what to do. I am able to view the introduction for level 3, but when i go to the purchase page it only show the beginners levels to select. Chrystal Combitsis on 8/5/2016: Hello, I am trying to add a header to the first page in my document (a mirror of what you have in your course) but it is not carrying over to the next page. My husband said it is because it is a different section, but he is not sure how to get rid of sections. I am using Word 2010 on my home computer but I will be using the 2007 version at my job. Can you tell me how to remove sections? I am looking online but it is way over my head. There are buttons when you are in the Header. Check Link to Previous is enabled.